Hi I'm back again! I'm really into using gold mirror card stock these days. 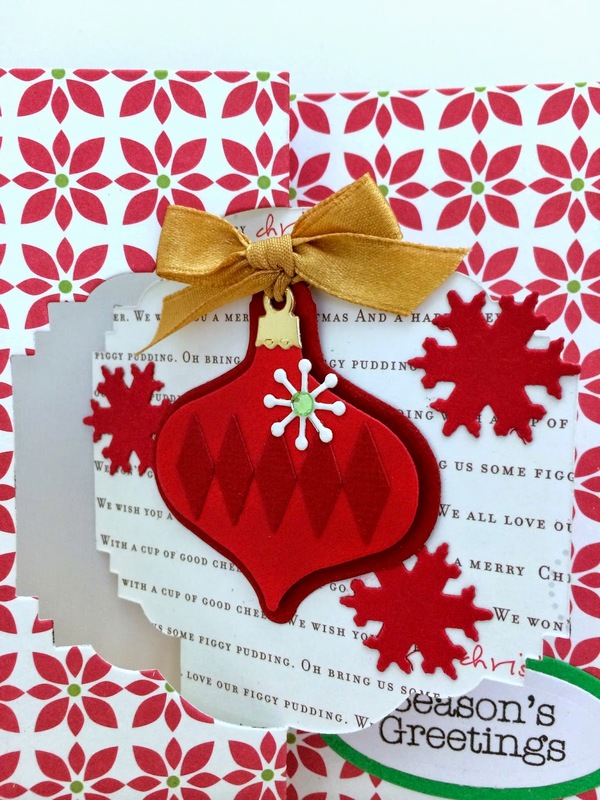 My husband ordered a bunch of Avery Elle's "season's greetings" dies and he wanted me to make a sample for him using the die. It's a pretty font and I like that the words are all connected. 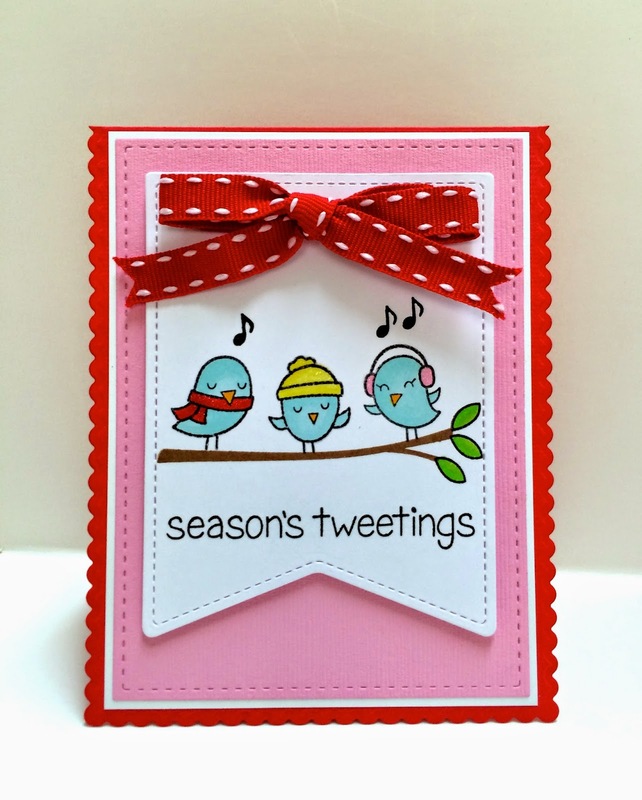 I had a bunch of stamped embossed cards lying around so I decided to use it for the card base. 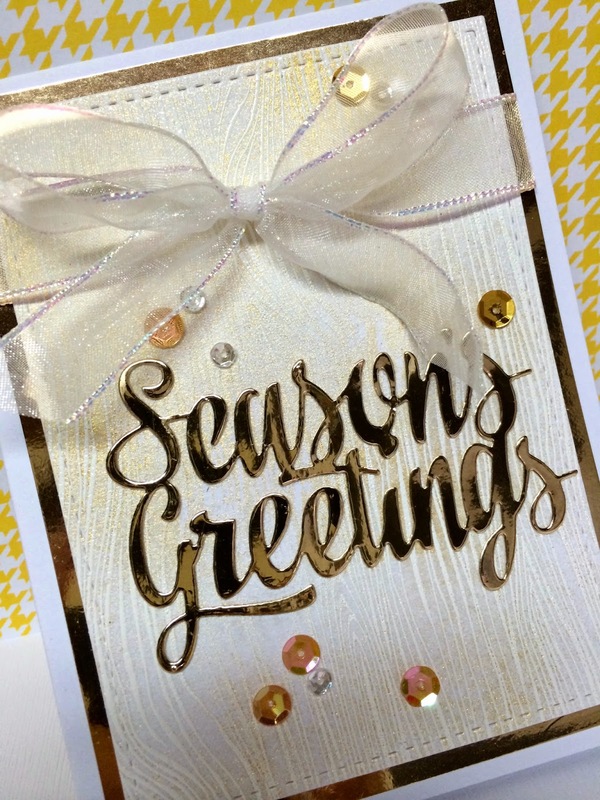 I finally got to use the gold sheer shimmer spritz from Imagine Crafts. It is so pretty and a nice shade of gold. I sprayed it on the card base. You have to see it in real life. 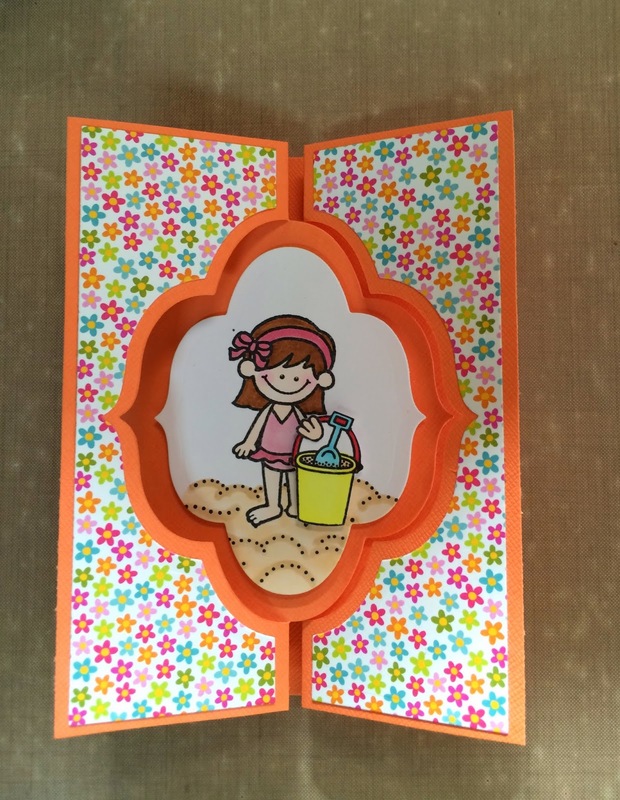 The sheer sequins is from Pretty Pink Posh and the gold sequins is from Doodlebug Designs. The stitched frame is Mama Elephant. Hope your weekend is going well! I am trying to recover from a bad sinus infection that I got earlier this week. Thanks for stopping by!!! Hi everyone!!! I thought I had posted this card but I guess I didn't. The stamp set is called "purrfect pair" by Mama Elephant. And I used the matching dies to cut the kitties out. I have never made a black card before but I wanted to use gold embossing powder for the sentiment and it just seemed to go well together. Reminds me of McKinley high school colors. Lol! I must say that the Mama Elephant clear stamps stamp very well. I forgot to take a photo of my Christmas card swap with the stamp club ladies so I had to take this one that I had given to one of the ladies. Our theme was baby shaker cards. Everyone did such a great job on their shaker cards. I didn't get a chance to take photos of the cards. 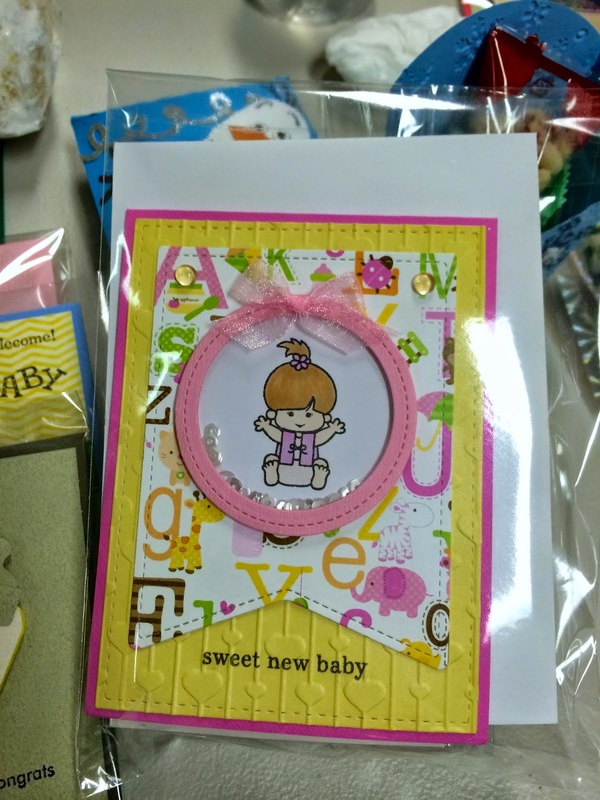 I used Dandelion Designs baby girl stamp set. Word sentiment is from Mama Elephant. Can you see Olaf peeking out from behind the top of the card? It was a cute pillow box favor. I didn't even know what that character was but found out that it is real popular with the little kids. So clever, it was made with punches. Thanks for stopping by today!!! I have so much to catch up on. Haven't made any Christmas cards yet or bought any Christmas presents. So much to do! 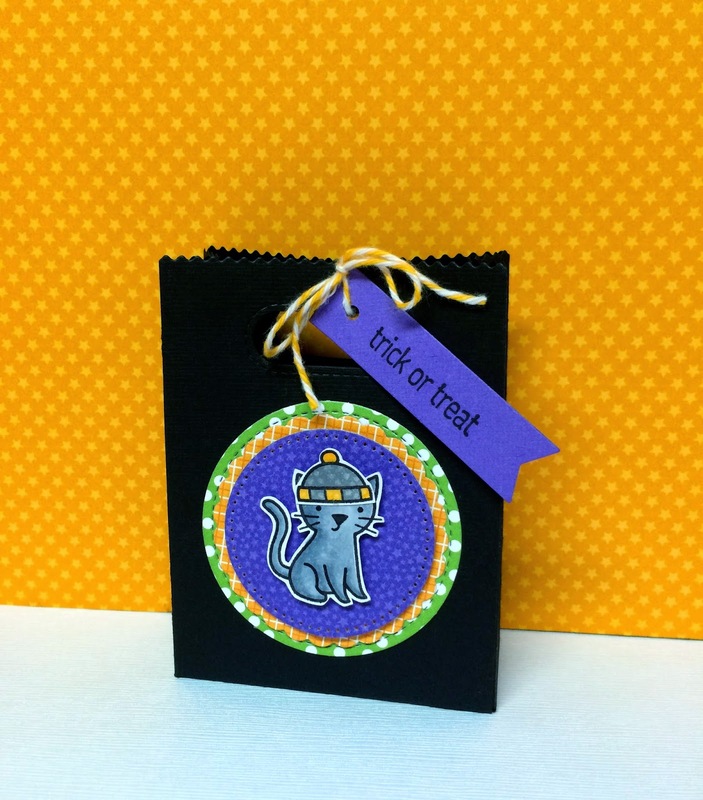 I colored this cute Lawn Fawn kitty couple weeks ago and had planned to make a card with it but ended up using it on this treat bag instead. Love this new treat bag die from Lawn Fawn. It is so easy to put together and make a bunch of them to pass out. Thinking about using it to take to my doctor's office for the office girls. All the dies used on this treat bag are from Lawn Fawn. Omg, today feels more like 95 than 90 degrees. Earlier this morning while I was working at Don Quijote's, I was actually freezing and had to wear a hoodie and my fingers were numb. I couldn't wait to get out of the store! Now I'm so hot that I want to go back to cool off again. Lol! Is it just me feeling extra hot these days or is everyone else feeling it too? Plus the addition of hot flashes along with the heat. Ugh! I finally got my hands on this banner die from Lawn Fawn and been busy cutting extra banners. I decided to make a simple card, stamping and coloring the images. 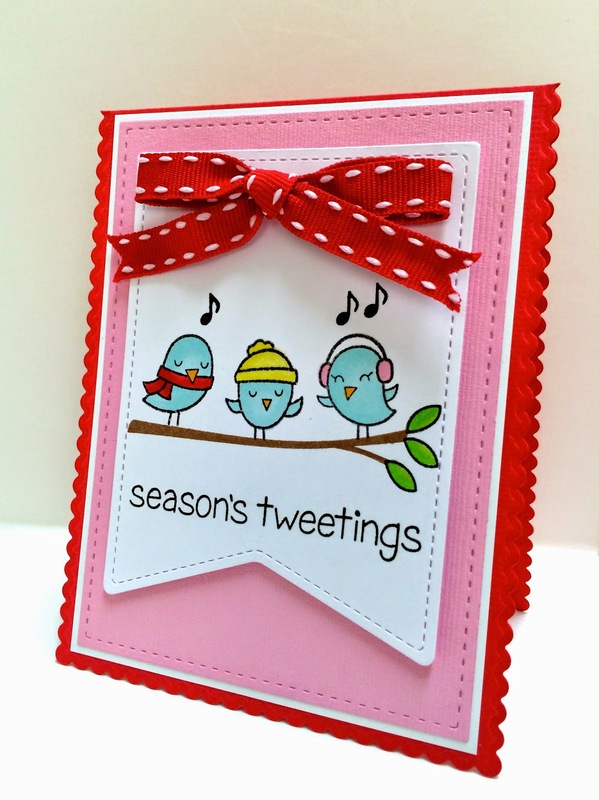 This birdie stamp set is so cute! I normally use Imagine Craft's Versafine or Memento inks but I decided to use Ranger's Archival ink to stamp the brown tree branch. It's a really good ink to stamp and the images come out crystal clear. 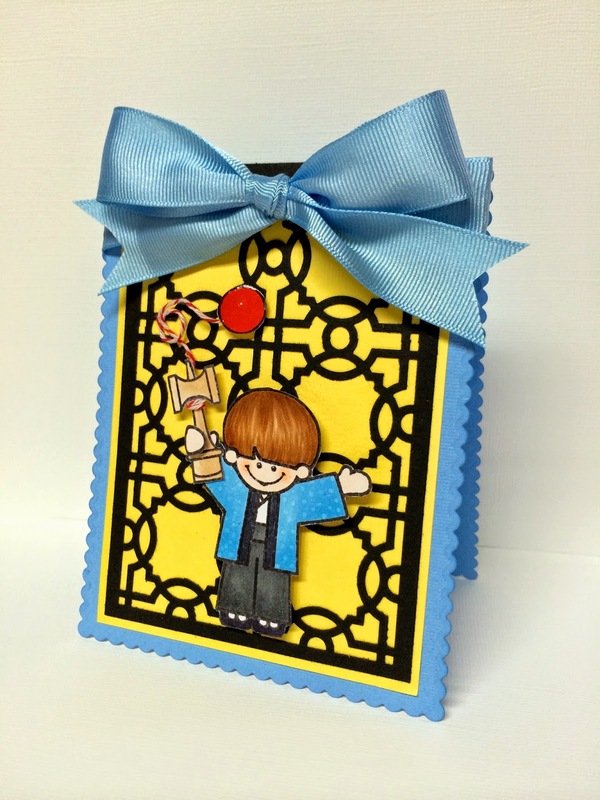 The card base I used for this card is from Mama Elephant. My husband will be carrying these dies at his store soon. It should be here any day now. Hope you're having a great week. I've been really enjoying my new part time job. I didn't think I would like it as much as I do but I don't have any stress while I am working. Plus I get to see people that I haven't seen in a long time. 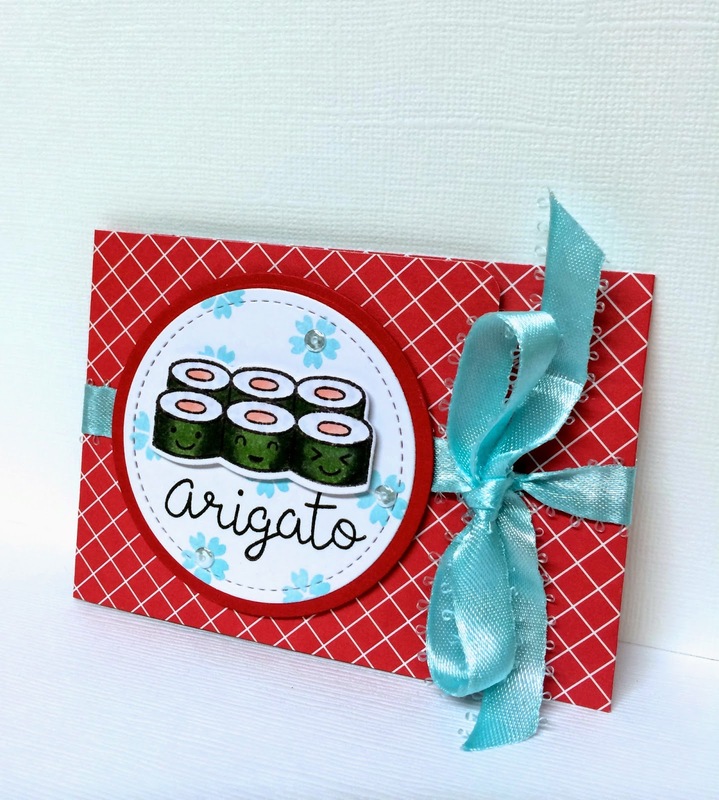 I've been having fun with Lawn Fawn's let it roll stamp set. 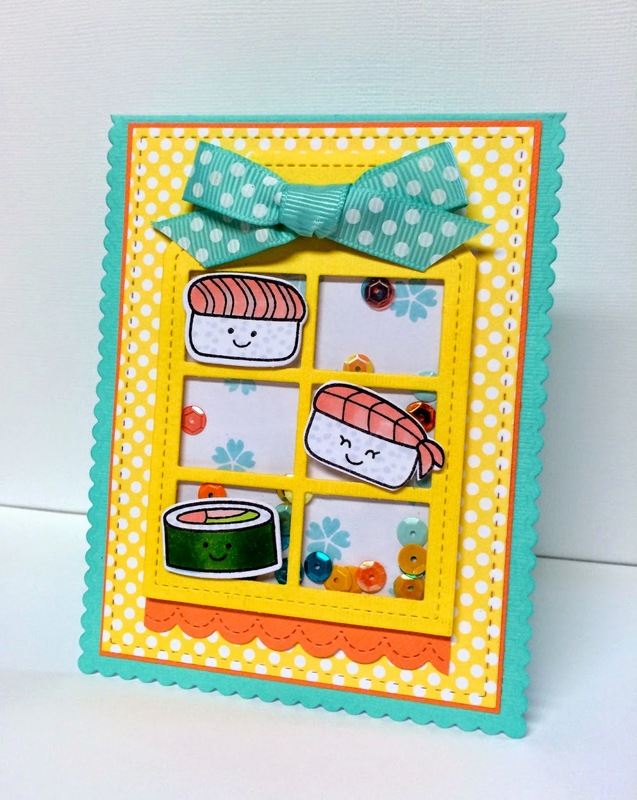 Yesterday I made a shaker card using the sushi stamps and sequins from Doodlebug. 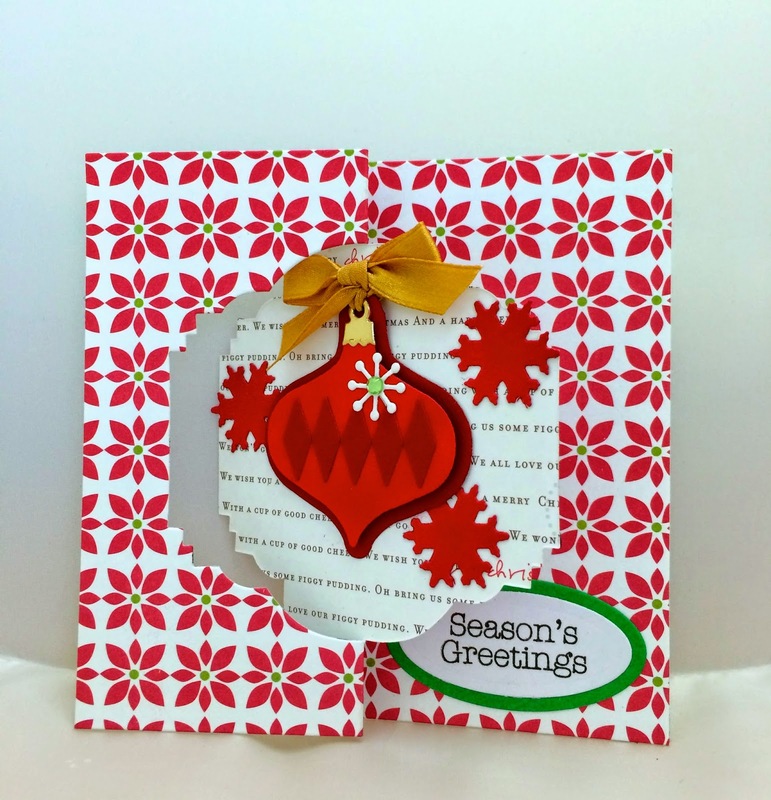 I used scraps that I had lying around my craft table for the card base. I've had some requests for a tutorial on the card that I posted on the post below. So here goes and I hope I can explain it so you can follow along. 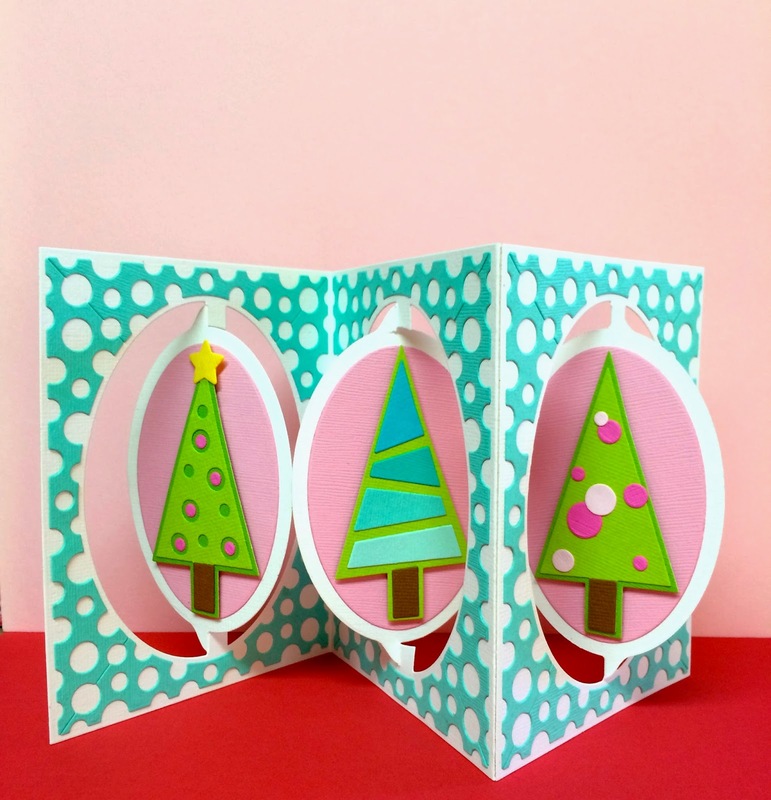 I saw a video on Stephanie Barnard's you tube channel showing how she used a stand up die set called "elegant stand up"and made it into a gatefold card. This is what the die looks like. Cut 2 pieces of card stock - 8 1/2" x 5 3/8". Place base die faced down on your cutting pad and weave the paper through the part of the die that has the part that will flip up. Make sure that you place the paper over the bottom of the die and not under because you don't want it to cut through where it supposed to cut. 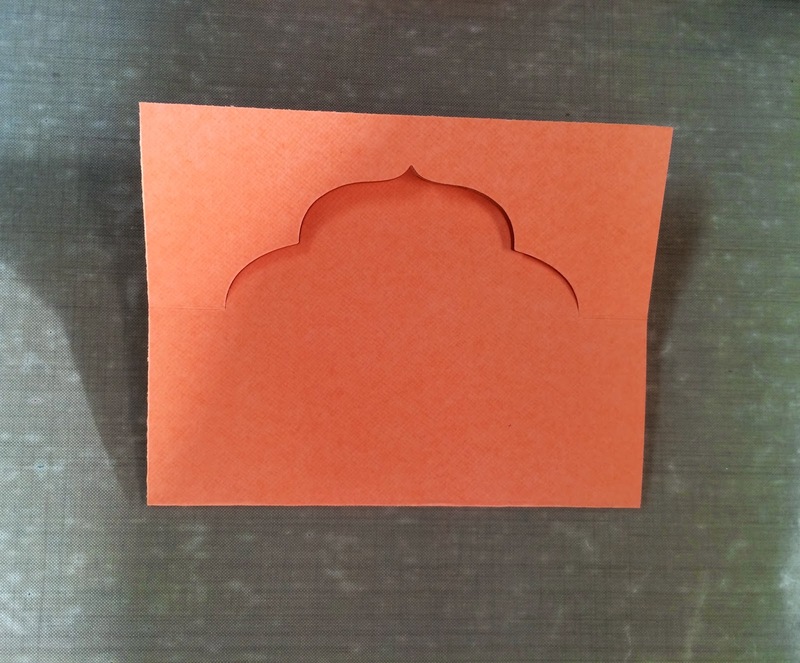 Instead, it will make a slight fold line. And make sure that you stop the opposite end of the paper where it supposed to make a score line. Do not go beyond that line. Center it well. Cut each piece separately. 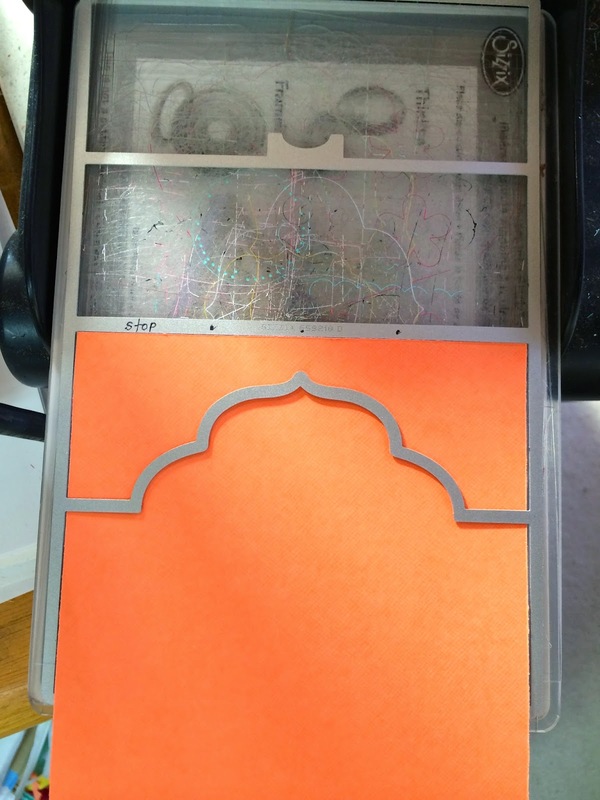 Do not cut both pieces together as it will cut through the scored part of the card. 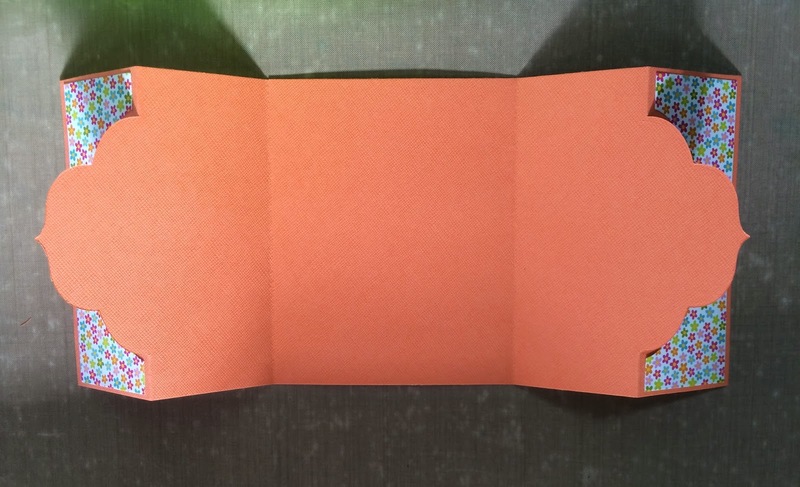 This is what your cut piece will look like after you fold it on the fold line. 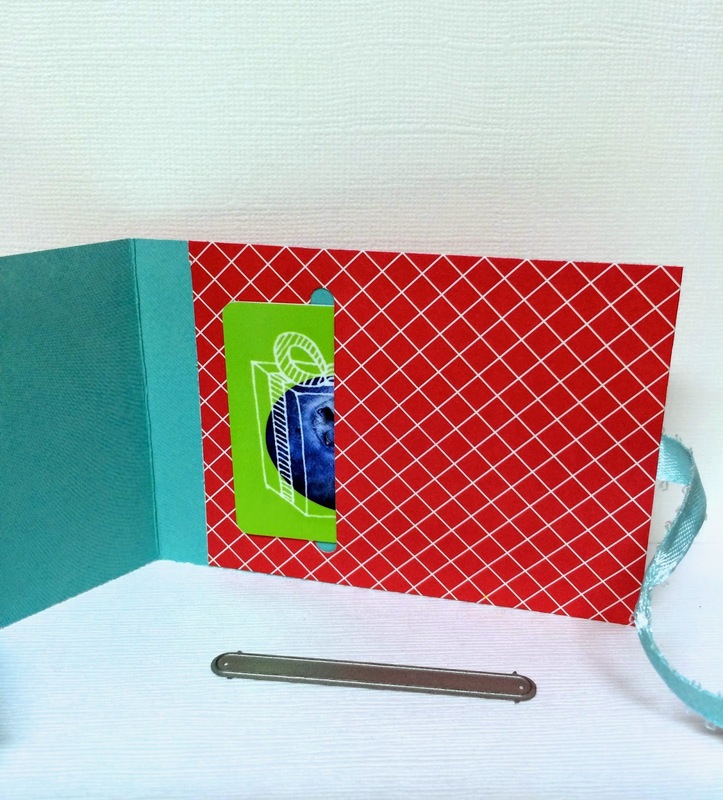 You can also use one of the die pieces to cut a piece of paper to layer on the side of the card. Glue the 2 middle sections together, one piece on top of the other. This is what makes the gatefold part. 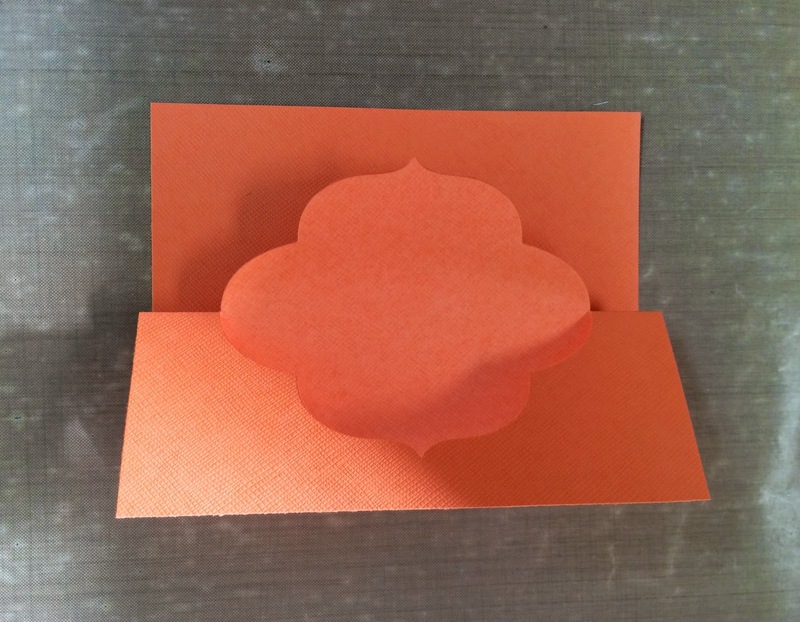 You can also decorate the inside of the card. Here is how the card looks when you close it. Email me if you have any questions. 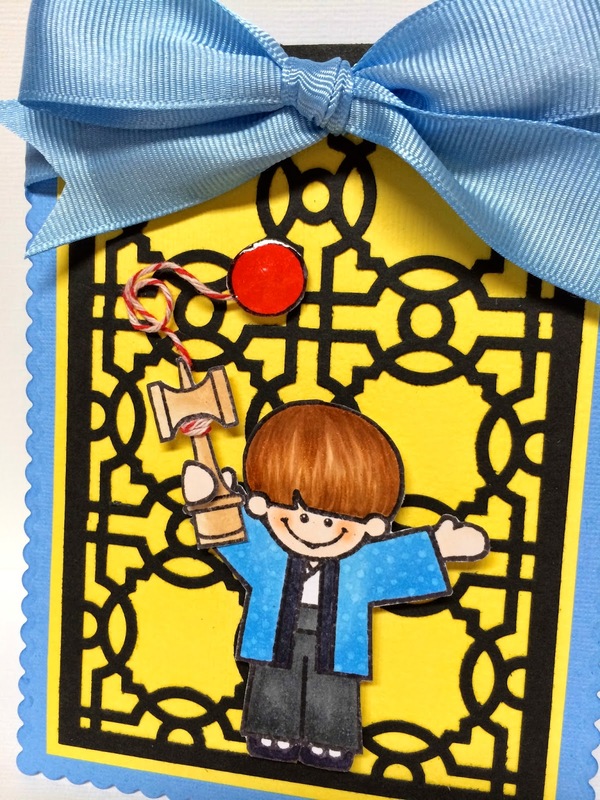 Hope you have fun making this card!!! Today was our stamp group get together and it was my turn to do the make & take. 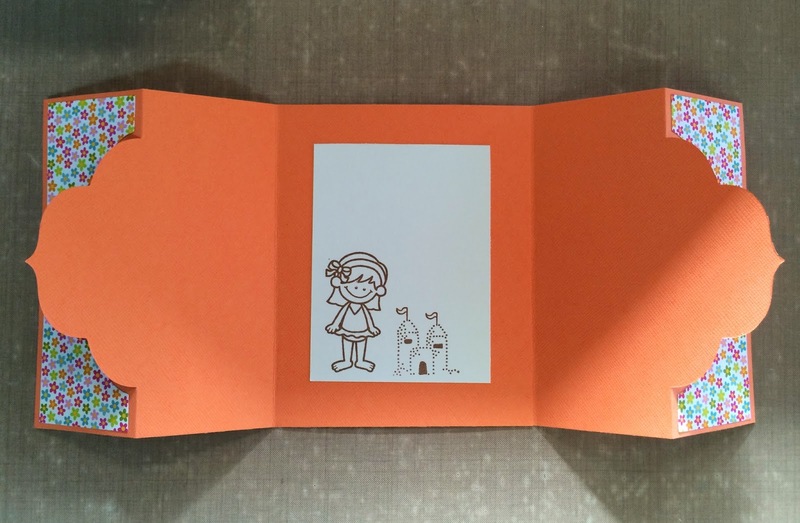 I saw on one of Stephanie Barnard's videos that she made a gatefold card out of one of her stand up die sets and I thought I'd do that for the make & take. I'm not sure why the photos are so bright but I've been noticing lately that when I post on blogger, my photos seem much brighter than it really is. I'll have to play around with it later. 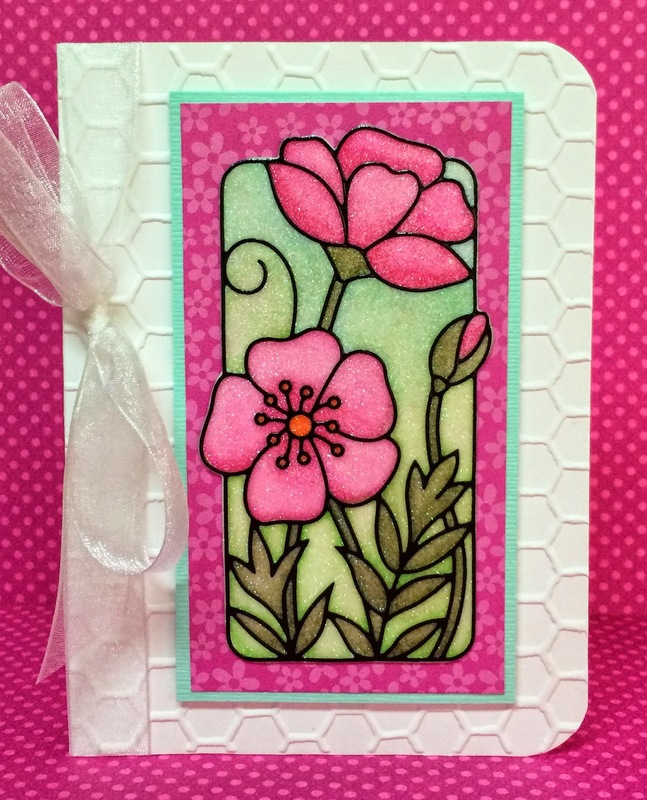 I used Dandelion Designs aloha stamp set to make the card. 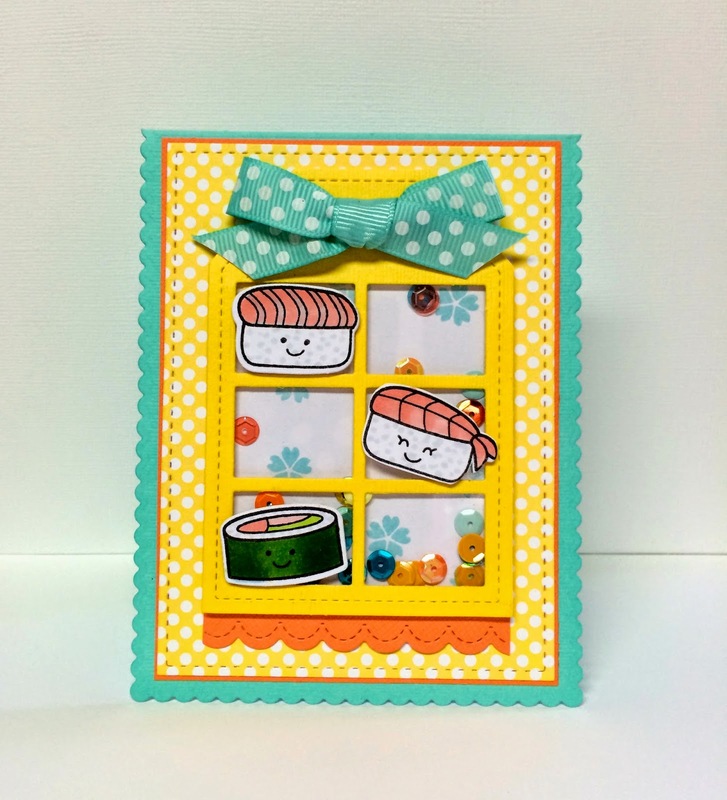 Patterned paper is from Doodlebug Designs spring fling release. Here is what the card looks like when it's opened. And partially opened so you can see how it folds. Well, today was really hot and muggy and the news said tomorrow will be the same. Hope you're enjoying your weekend and thanks for stopping by!!! 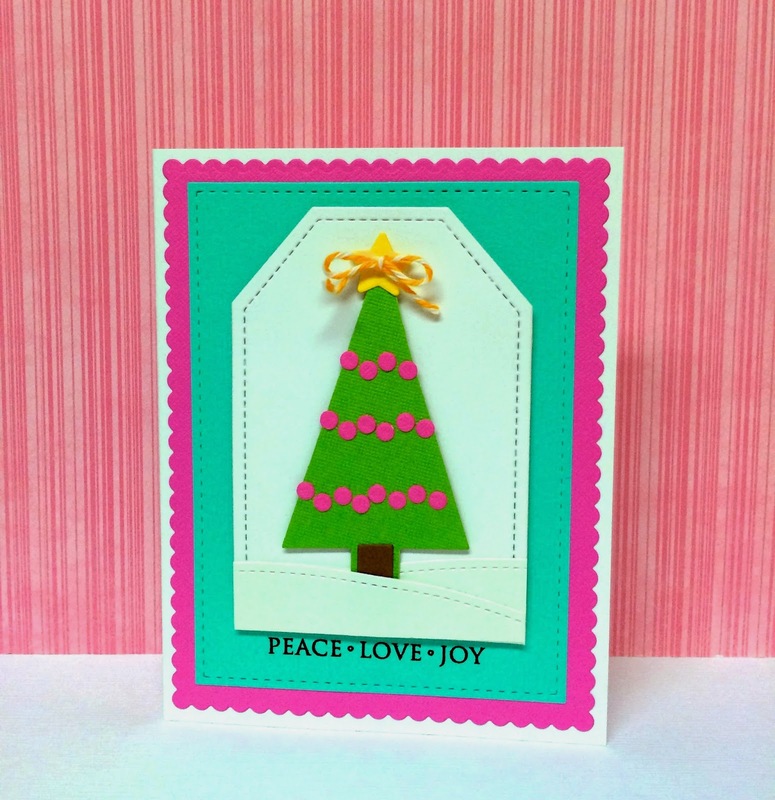 This is the first time that I have used Lawn Fawn stamps & die cuts and I really like the quality of their products. The only problem that I had initially was the stamp wasn't taking the ink so I had to lightly buff the stamp and then it worked. Making this card helped me take my mind off of getting stuck in a really old elevator today. Ugh! Nothing worst than having to go looking for my shipments in a so called haunted basement. Very creepy and I'm not kidding! Anyways, back to the card. I used Lawn Fawn "let's roll" stamp and die cut set and Mama Elephant dies to cut the card base. I love using bright colors, makes me happy! Patterned paper is from My Minds Eye. I used copic markers to color the images. I'm surprised that I still have ink in the markers since its really been awhile that I have used them. 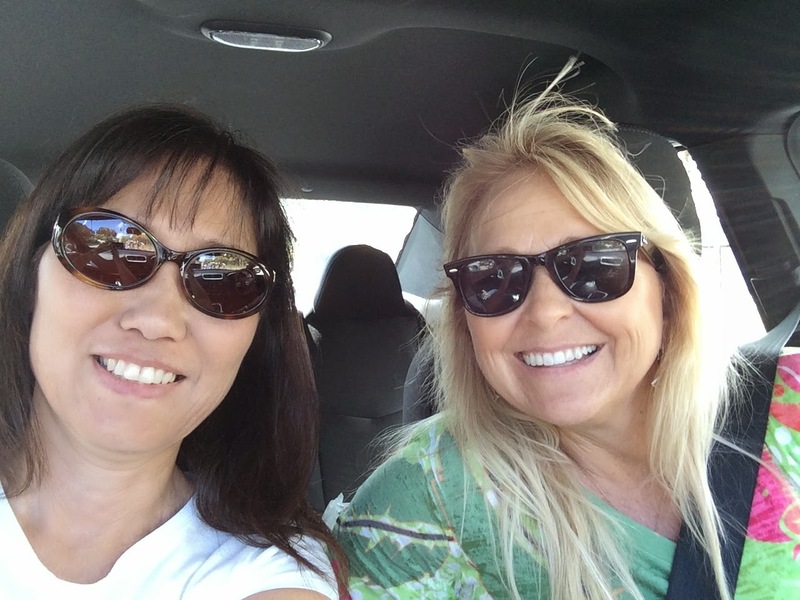 Thanks for stopping by and I hope to keep up on my blogging! 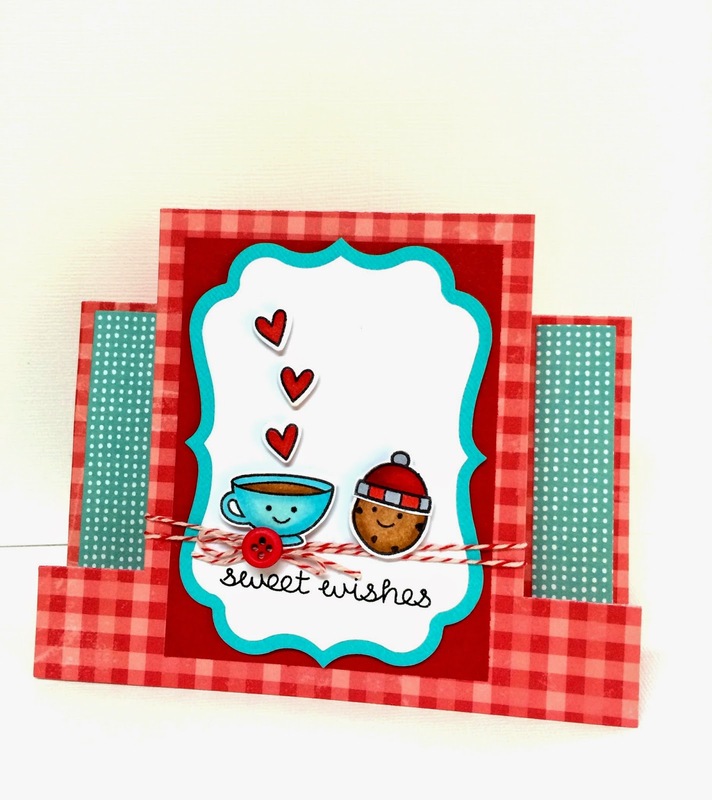 While I was waiting for my husband to come home today, I decided to make something with one of the new die releases from Lori Whitlock for Sizzix. I used the owl favor bag die to make this. I thought it was going to take me longer to make it since there were quite a few pieces to cut, but it took me longer trying to figure out what papers to use and the colors to match it. It's a really cute bag and I think this would look great in a Halloween theme or Christmas too. 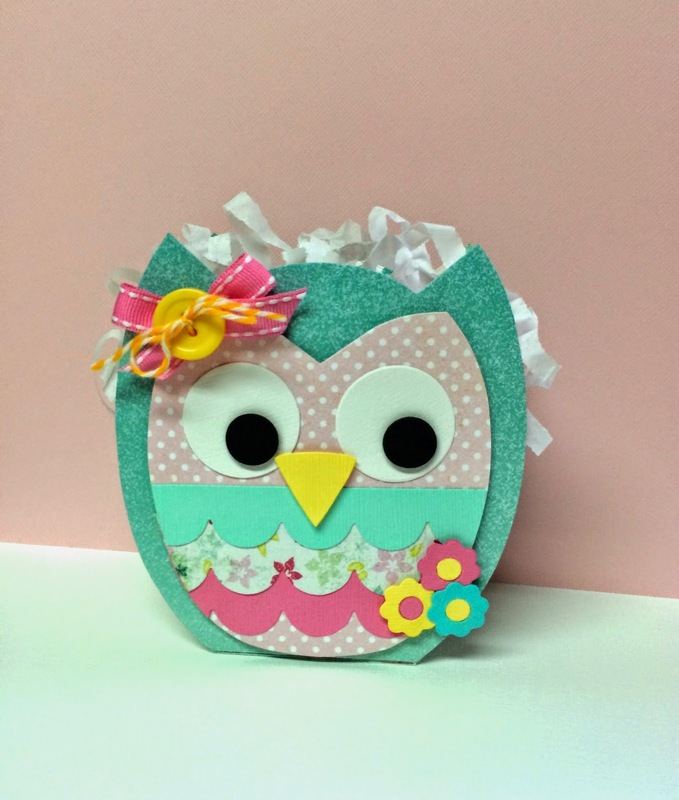 You can also use the owl face on a card front or scrapbook page. I forgot to take a picture of the top of the bag so you can see how wide it is. If you get a chance, go check out the new dies by Lori Whitlock. Today I started off making a flip-it card, and somehow got distracted looking for paper to match and ended up making a watercolor card instead. I used Elizabeth Craft Design's flower sticker and glitter and Hero Arts watercolor paper. Love this glitter because it doesn't flake off. I wanted to try these pens that I sell from Tombow called dual brush pens. They really are that good for watercoloring! I used Tim Holtz water brushes to blend the different color shades. This is the first time I made a watercolor card. I was so impressed on how much water I used and the paper never warped. And the ECD glitter is amazing for watercolors. I know it's a little hard to see the glitter on my card but if you click on the picture, it should make the image bigger so you can see it. Think I'll try some different methods of watercoloring during the Memorial Day weekend. 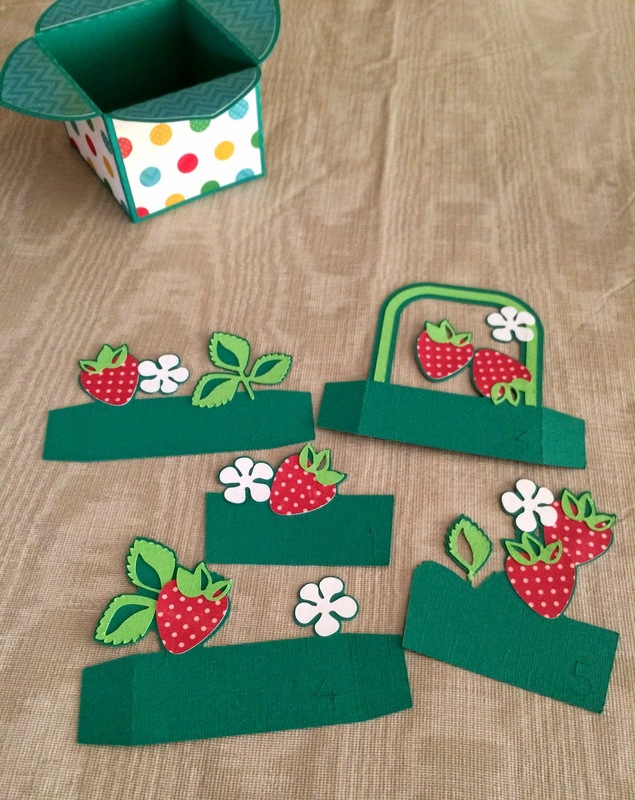 I haven't used my Eclips machine in awhile, so I took it out the other day to make some box cards. I bought a file from SVG Cuts a couple weeks ago. 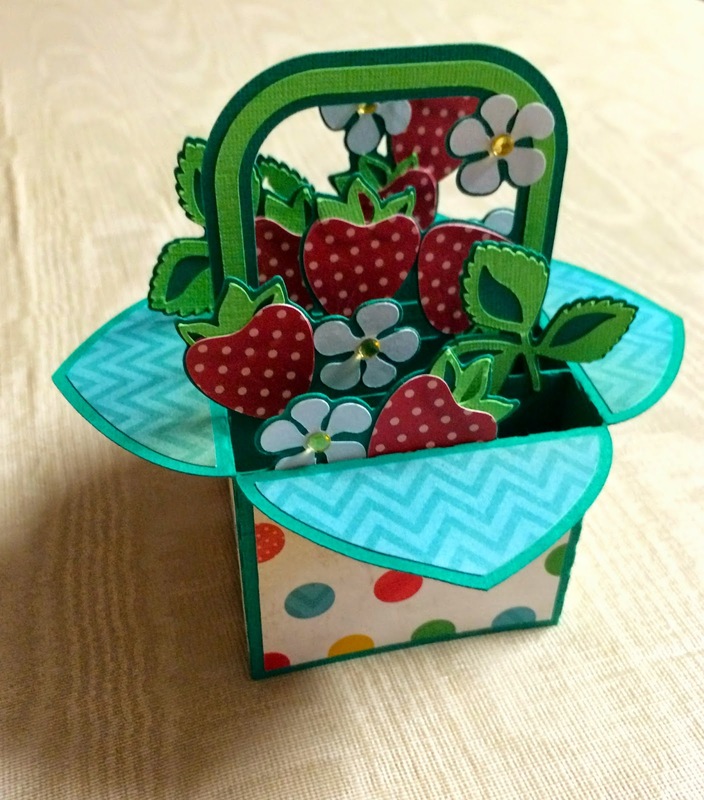 Here's the strawberry basket box card that I made. I love how it folds flat so you can mail it. The hardest part was trying to find paper to match all the colors that I wanted to use. 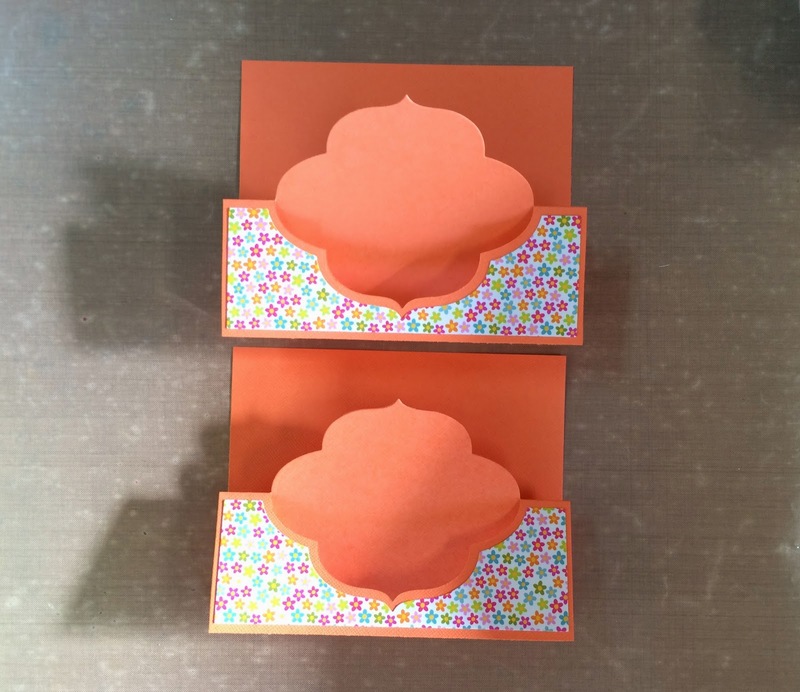 These papers are from Kaisercraft. 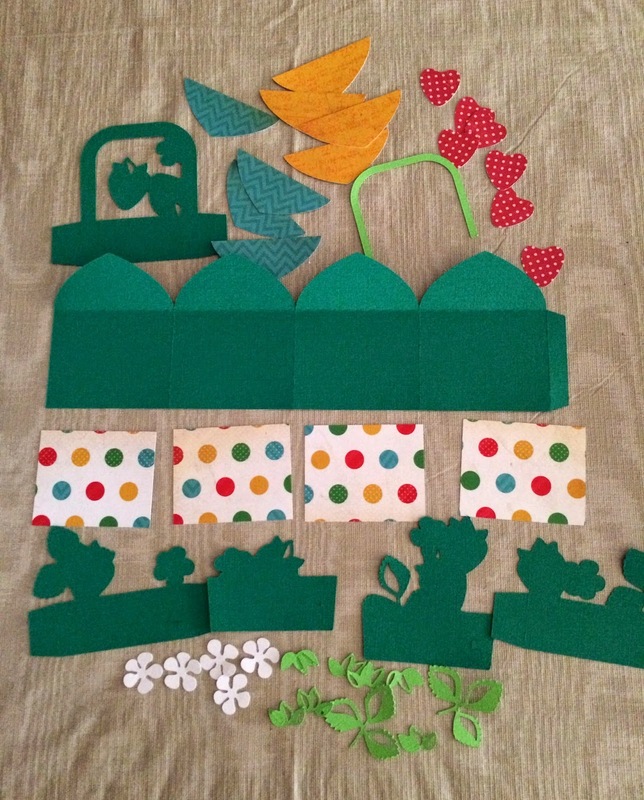 These are all the pieces that I cut to assemble the card. It looks like a lot but it really isn't since the machine is cutting it out for you. 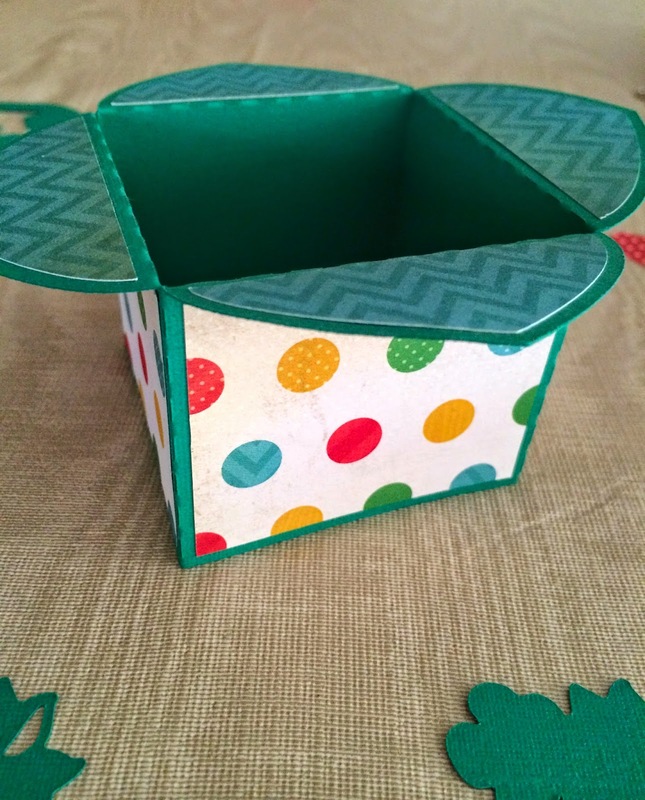 This is the box part of the card. And here are all the inner pieces with the strawberries and flowers glued to it. The machine even cuts the numbers on the pieces so you know what order to put it together. I stuck yellow gemstones in the center of the flowers. And here's the finished card! This week was a little tough. 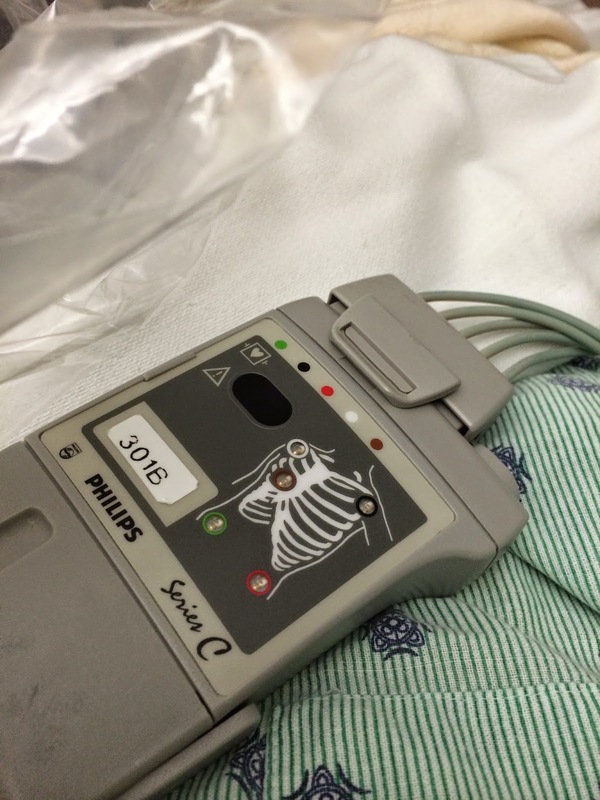 My stepmother had been in and out of the hospital since March when she went into a diabetic coma. 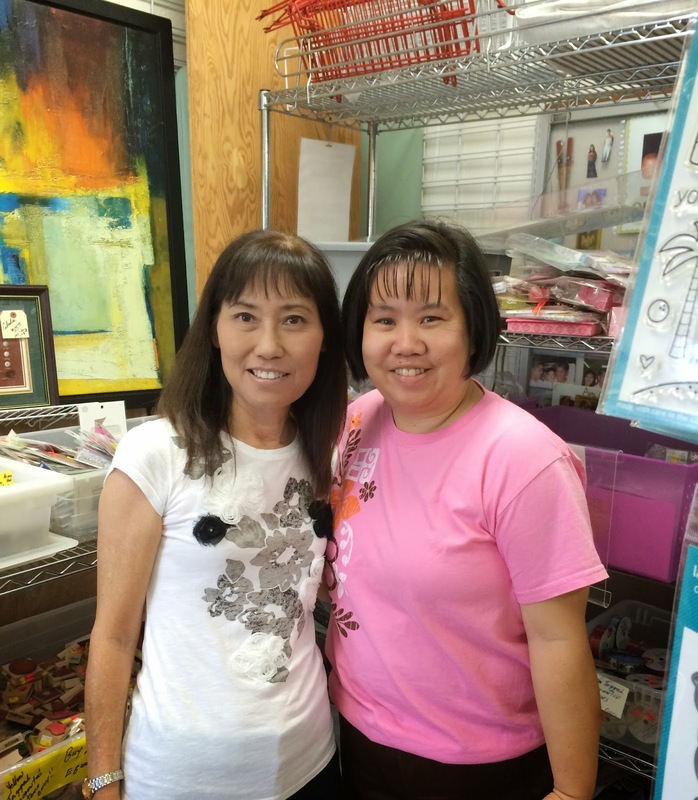 In April, she suffered a massive stroke and her right side of her body was paralyzed and she lost her vision in her right eye. Well, the doctor sent her home since there was nothing more that they could do for her. She lived for 2 weeks and passed away on Wednesday which is the same date that my dad passed away 5 years ago. Weird huh? 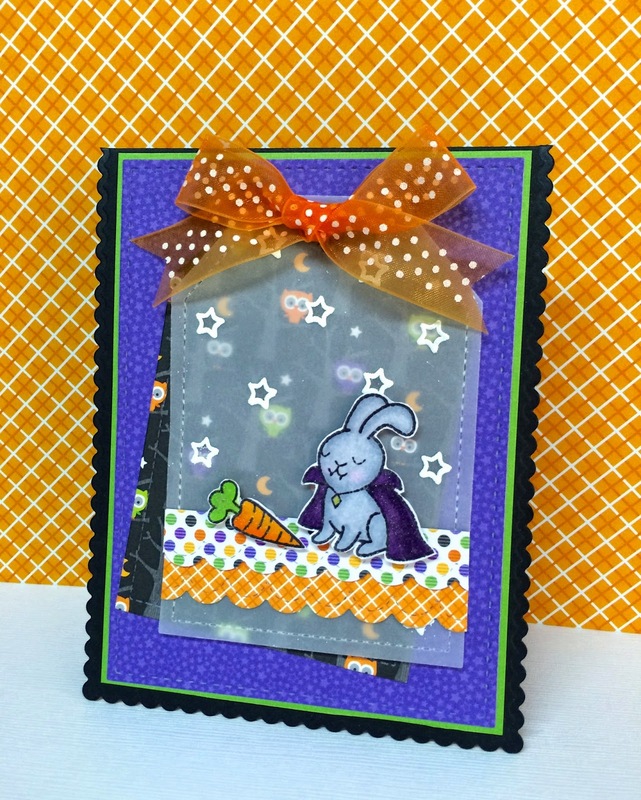 I have another box card that I made yesterday and will post it later so hope you stop by the blog again. Have a great weekend!! !